The past two decades have brought about remarkable change to Bogotá. Once known as one of the most violent cities in the world, the city has transformed into a modern, cosmopolitan, dynamic and green urban model for other cities of the global South to follow. Such a transformation reflects broader processes across the whole of Colombia, as a result of state policies of economic deregulation and heavy securitisation of urban centres; producing investor and tourist friendly cities. Under Álvaro Uribe’s presidency, economic deregulation was introduced to Colombia’s economy in order to entice foreign investment to the country’s cities. However, rebranding the country as ‘good for business’ depended on the illusion of ‘safety’ particularly in Colombia’s cities; unfortunately ‘safety’ was to come at a heavy cost. Widespread state-sanctioned violence and repression toward both urban and rural residents was subsequently carried out, justified as a fair price to pay for the country’s ambitions to achieve ‘security’ and ‘development’. 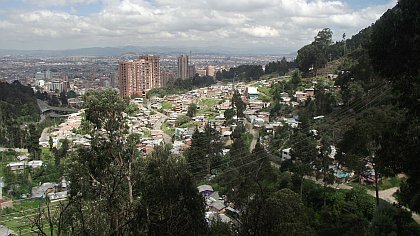 In Bogotá, new streams of foreign investments alongside the withdrawal of public spending, lead to extreme spatial inequalities between internationally financed, hypervigilised real-estate for investors and tourists, and the dilapidated, forgotten neighbourhoods to which forcibly displaced populations from all over the country fled. As such, alongside and partly due to the securitisation programme, Bogotá has become one of the most expensive and uneven cities in Latin America. Previously underinvested, ignored social issues in the city have subsequently become valorised for capital-led forms of urban development, including security and the highly contentious issue of environmental protection. Over the past 20 years, the number of urban conservation areas in Bogotá has grown to cover 83,901.87 hectares, more than half of Bogotá’s urban area. Many of these conservation sites are surrounded by, or overlap with, prime real-estate land, often ‘informally’ inhabited by less privileged urban residents. In most of these areas, official conservation strategies stand in direct conflict with the expectations and everyday practices of the local population. Due to the failures of past conservation strategies, contemporary conservation is heavily endowed with a language of community participation. In Bogotá however such ‘participation’ translates simply to the signing of consent forms, often after the dispossession has ocurred; while ‘conservation’ is routinely administered to valorise areas for potential investment, and in doing so serves to dispossess local residents who can ill afford their newly valorised neighbourhoods. Conservation strategies in the city fundamentally dismisses the important work that local community members undertake towards the protection of those environments they have long inhabited. The idea that preserving natural spaces requires sanitising areas from contact with the poor, contradicts the historic role those who live in urban conservation areas have played to maintain the city’s green areas. Many of these communities feel a true commitment to caring for forests, rivers, and plant and animal species. In these neighbourhoods, nature is present in all aspects of life, many make it their responsibility to keep a watchful eye on the area –calling the police when debris is thrown, rescuing and caring for animals that fall in gutters, organizing the community, picking up trash, teaching children about the ecological importance of the neighbourhood, denouncing large construction companies, the list goes on. Most of the residents of designated conversation areas traditionally integrate natural spaces with their homes, streets and neighbourhoods. Living in these neighbourhoods is living in nature. And although this is not always a romantic, power-free relationship, their connections with natural resources are profoundly intertwined with their identities, histories, and personal and collective expectations. Their lives are a permanent exercise of evoking, experiencing and reproducing the practices of being in touch with what, to outsiders, is considered ‘wilderness’. As nature is integrated into the home, and not a distinct, recreational site elsewhere, there has been strong social and economic connections between in the two in areas such as Bosque Calderón (pictured), for more than a hundred years. As one of the inhabitants of a forest neighbourhood located within the mountains east of the city puts it: “I love living here... [because of] the air, the freedom one has here. This still feels like a small town, like the countryside... it is all silent, there are animals...” (09.22.2012). In another neighbourhood within a wetland called Techo, residents recall the absence of officially recognised wetland until only recently. They tell how conservation of the area and the prevention of development or landfill on the site is the result of their own interest and timely efforts and not any municipal 'conservation strategy'. As in the case of Bosque Calderón, there exists a strong relationship between housing rights and conservation. It makes no sense to draw a line between home and habitat; the right to decent housing implies the right to a liveable environment. As the residents put it “we protect our Techo (literally “roof” in Spanish), we defend our rights” (Protegemos nuestro Techo, defendemos nuestro derecho). Conservation strategies in Bogotá however, often operate to stigmatise the city’s urban poor, rendering them ‘invaders’, a delegitimizing process which often justifies disinvestment from poorer neighbourhoods, eviction and even direct violence. For many public officials, those who have lived for many decades in later declared conservation areas are now ‘illegal’ and ‘invading’ natural sites that belong to the general public. Despite the fact that ‘conservation’ is cited as a key justification for eviction, it is common for these same sites to be subsequently sold off by the state to high-end property developers to build neighbourhoods with exclusive views and access to “green” areas of the city. Official city conservation policy restricts the access of local inhabitants to areas designated ‘at risk’. This is despite the areas having long been conserved for generations precisely by those who are now portrayed as their destroyers. They oversee and manage the tight connections between society and local ecologies, yet their political and legal rights as residents are dismissed. Deemed as threats to the ecological stability and viability of key conservation areas, residents are criminalized and put under pressure to leave. While the less privileged are on the verge of eviction, nearby businesses and residential buildings flourish, allowing popular and official discourses to celebrate investment, industry and growth. Such are the paradoxes of a deeply uneven city; those privileged enough are able to purchase in a few months, what others have been fighting for generations: a place in the city. In this way, only meters away from the stigmatized, illegal areas of the city’s urban poor, tenuously legal high-rise buildings marketed to the middle and upper classes are built in a matter of weeks. The speed with which these exclusive apartment complexes emerge sharply contrasts with the generations the urban poor have spent waiting for basic services to be installed, for titles to be recognized, for permits to be issued, even for orders of resettlement to be signed. It is in that sense that conservation becomes a new rationale for excluding Bogotá’s less profitable spaces and populations from the city, and wherein everyday conflicts and negotiations around use, access and control of conservation areas emerge. These fragmented spaces of conservation deepen the uneven geographies of the city; a city where access to a healthy living environment is a privilege one has to pay for, and not a right. While for certain urban conservation is an urgent task, it will not succeed at the expense of its traditional carers, the local residents. Instead, we must take into account the confluences between struggles for a better quality of life and the search for more sustainable environmental practices. This implies taking seriously the multiple ways in which, from below, another less perverse version of a ‘green city’ might be possible.